In storage with Legend Flyers in Everett, WA. Just waiting for someone to pay the bucks to finish the project. Of course, it is one of the new build -262 airframes. Recently, I joined the team at RCN News Magazine as the Modeling Editor/Columnist and the first issue of the magazine was published this month. You can download the magazine and/or buy your print copies here and can visit the magazine website here. The following was passed along by Hawk One pilot Dan Dempsey. Also note that Hawk One has lost its Centennial of Flight tail markings and gained a Red Ensign and GH! (OTTAWA-GATINEAU) Vintage Wings of Canada re-dedicated its Discovery Air Hawk One F-86 Sabre on April 26 in honour of LCol (Ret’d) Fern Villeneuve, the first leader of the RCAF Golden Hawks and a member of Canada’s Aviation Hall of Fame, during a special ceremony at its hangar in Ottawa-Gatineau. At 84, Villeneuve is one of Canada’s oldest active pilots and still flies his own private aircraft. 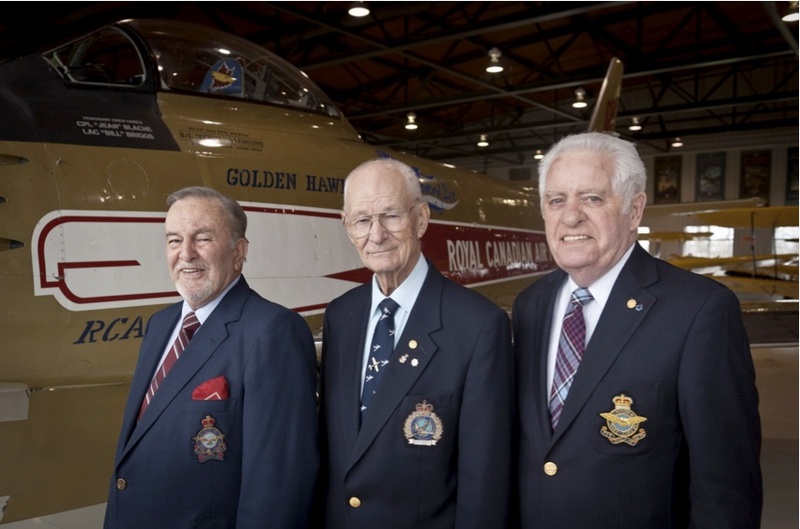 The re-dedication was in keeping with Vintage Wings’ “In His Name” program designed to recognize Canadians who have made a special contribution to Canada’s aviation heritage. 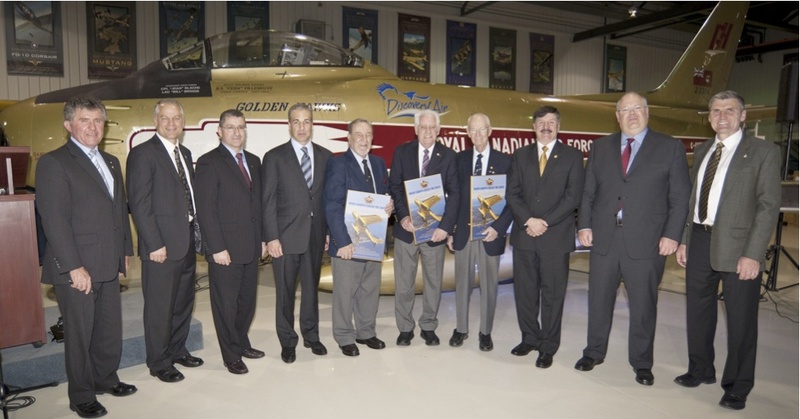 To also recognize the contribution of technical and support staff to the success of the Golden Hawks, two former long serving members of the RCAF were also honoured by being named “Honorary Crew Chiefs” of Hawk One. 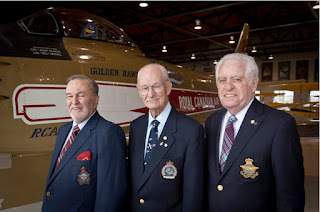 MWO (Ret’d) Bill Briggs served for five years as an aero-engine technician on the team and Cpl (Ret’d) Johnny Blache was the graphic designer who designed the original Golden Hawk paint scheme to celebrate the 50th anniversary of powered flight in Canada in 1959. The names of all three gentlemen now adorn the fuselage of Hawk One. The surprise announcement was made by Mr. Didier Toussaint representing title sponsor Discovery Air, accompanied by LGen André Deschamps, Commander of the RCAF, and Hawk One team leader, LCol (Ret’d) Dan Dempsey. The overwhelmingly popular proclamation yielded a standing ovation from some 200 dinner guests celebrating the launch of the 2012 airshow season in Canada. For the past two years the F-86 Sabre had been dedicated to the memory of the late Al Lilly, a former member of the RCMP and later a Canadair test pilot who became the first pilot to fly supersonic in Canadian airspace on August 8, 1950, when he took the prototype Canadair Sabre through Mach 1 in a vertical dive. Sword is another Czech producer of injection molded kits and they followed up their recent Spitfire Vc series with a Seafire Mk. IIc. It includes one sprue from the Spitfire kit along with a new sprue of Seafire specific parts, some resin cannons and fairings, and an injection modeled canopy. Sword is quite a refined producer of short run models and the parts are well molded with clean detail. Options abound with two sets of wheels, two choices for wingtips, three spinners and propellors, and the choice of the standard or tropical filters. Scribing is very fine, maybe too fine for some modelers. Detail in the cockpit is very nice and it looks like it will assemble just fine if you take some care. Sword did account for the difference between the Spitfire and Seafire by providing a new sprue, including a Seafire fuselage and also provide plastic parts for the hook and fairing. Decal options are for 899 Squadron of the HMS Indomitable, 885 NAS in Northern Ireland, and 834 Squadron of the HMS Battler of the British Pacific Fleet with a cartoon stork nose art. All necessary markings, including stencils are provided. The Sword Seafire is an expensive kit, with a price over $20.00, but it is the best 1/72 plastic Merlin engined Seafire currently on the market.